Paul Kennedy owes a great deal to the editor who persuaded him to add a final chapter to this study of the factors that contributed to the rise and fall of European powers since the age of Spain’s Philip II. This tailpiece indulged in what was, for an historian, a most unusual activity: it looked into the future. Pondering whether the United States would ultimately suffer the same decline as every imperium that preceded it, it was this chapter that made The Rise and Fall of the Great Powers a dinner party talking point in Washington government circles. In so doing, it elevated Kennedy to the ranks of public intellectuals whose opinions were canvassed on matters of state policy. From a strictly academic point of view, the virtues of Kennedy's work lie elsewhere, and specifically in his flair for asking the sort of productive questions that characterize a great problem-solver. Kennedy's work is an example of an increasingly rare genre – a work of comparative history that transcends the narrow confines of state– and era–specific studies to identify the common factors that underpin the successes and failures of highly disparate states. 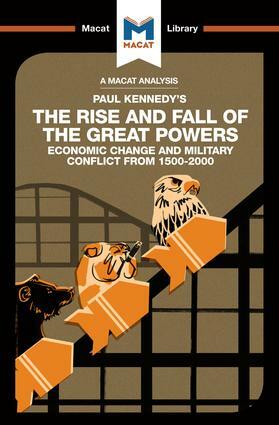 Kennedy's prime contribution is the now-famous concept of ‘imperial overstretch,’ the idea that empires fall largely because the military commitments they acquire during the period of their rise ultimately become too much to sustain once they lose the economic competitive edge that had projected them to dominance in the first place. Earlier historians may have glimpsed this central truth, and even applied it in studies of specific polities, but it took a problem-solver of Kennedy's ability to extend the analysis convincingly across half a millennium. Riley Quinn holds master’s degrees in Politics and International Relations from both LSE and the University of Oxford.